Hersh takes her insights and weaves them in with the craft of the gifted lyricist that she is. 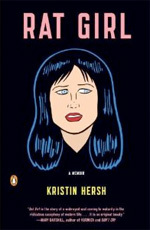 According to the reviewer in Booklist, “Song lyrics and diary entries mix with Hersh’s memories, which read more like poetic, sometimes satiric impressions rather than traditional autobiography….Hersh presents a refreshingly raw, insightful, and singular coming-of-age story.”Again, Hersh is a free-wheeling memoirist not an autobiographer of a life viewed from the illusion of objective taxonomist. Kristin Hersh is better than a seductive writer/musical artist, she casts a spell without either one of us looking or understanding what just happened. Be sure to schedule a 15-minute complimentary book coaching session via email: AuthorizeU@gmail.com. If we begin working together, my eBook—Writing From Life: A Wise Guide to Publishing Your Memoirs—will be yours as part of the coaching package. The founder of a cult rock band shares her outrageous tale of growing up much faster than planned.